I know this article is long and that as Americans we have a very short attention span.... but please, grab a cup of Jo and read this carefully. It is VERY good. This essay provides a critical analysis that ends any confusion as to whom and what we must confront, and the immediate actions we must take if we are to defend Israel and preserve America’s soul. There are those who say the problem between Netanyahu and Obama is not a crisis, but a mere family dispute, or political jostling. These words deflect from the reality we can no longer ignore. THE WORLD IS HUNTING JEWS AGAIN, and our President, President Obama, has joined the expedition. We are witness to an event in America that defies comparison in American history. Will the legacy to our children be the quenching of the Lamp of Liberty? It is obvious by his recent G8 declaration. that Obama has joined forces with Abbas, Hamas and 150 nations worldwide to assail the Israeli Jews and drive them into the sea. He has crossed the point of no return. Petitions, sanctions, and withholding appropriations from Congress have proven worthless. We demand action, and the time to turn up the heat is now. In order to ensure Israel’s survival and preserve America’s soul, we need to put Obama on the defensive: Melt the phone lines to notify the American people that we have a President in the White House who refuses to denounce a terrorist initiative. Then, as with many before him who thought they could outsmart the American people, his arrogance will betray him and lead to his downfall. As history is our witness, Americans know full well whether their bell of Liberty rings true or not. We must avoid the diversions that amounted to mere damage control. Our job at Operation Joshua is to stoke the fire needed to expose Obama’s plans to end Israel’s existence, on a day-by-day basis, and keep it prominent at the start of each news cycle, so his pro-terrorist agenda does not disappear under Liberty’s radar screen. We can accomplish this if each person makes one call a day – each and every day – and ask a question that can expose and derail Obama’s plans to destroy Israel and reconstruct America in an image of his own making. With the constant increase in the number of participants, all making one simple call, we can flood the airwaves until the deafening roar is inevitable. Obama will hear our demands at every turn, behind every door, in Congress, on every pro-democracy radio and television station, on Facebook and Twitter. He will hear the message of Operation Joshua being drummed. To achieve success, we must be ever vigilant and repel the constant attacks that Obama levels against the American people, as he continues to divide us along cultural, class, and ethnic lines of a pre-Constitutional era. With our liberty in the balance, we must relentlessly attack his positions and expose his dictatorial mandates, because the media has been delinquent in demanding frank and timely answers to his behavior towards Israel and its lethal effect on the survival of all mankind. Because the classics provide insight into the full range of human behavior, I use them to clarify critical arguments and as reference in many of my essays. A case in point is Homer’s Odyssey and Circe’s warning to Odysseus about the Sirens – because it is a warning to us about the nature of our battle with the Man in the Oval Office. How many of our congressional representatives and religious leaders have visited the White House with good intentions only to be beguiled by Obama’s charm, and, once betrayed, are no longer capable of serving the people they represent? The numbers over the last two years are staggering, the situations endless. Even after a Republican victory last November, very little has changed. Yet our colleagues at Never Again Is Now have had no problem resisting his hypno-toxic advances, and it appears as though renowned author and columnist David Solway concurs. In his article “Can Sarah Upstage Barack”, http://pajamasmedia.com/blog/can-sarah-upstage-barack/ , Solway says, “Nonetheless, as Stanley Zir and Susan North warn, the electorate will need to remain vigilant against the quackery of the carnival barker they have elected as president. Yet this is not enough. Even the best of the media repeatedly fall victim to Mr. Obama’s unending deceptions and allure, whether they are made when he is losing favor or in the public’s good graces. Certainly the media missed his ruse at AIPAC as he tried to set up America and Israel for the final fall. America, we cannot rely on the analysis of after-the-fact reporters or we will be swallowed whole by this predator’s negative agenda. We must stay in front of him if we are to survive. After a few pleasantries, President Obama wasted no time getting down to the business of the day, leading the participants at AIPAC down the primrose path. He began by first assuring them that he would never approve a United Nations resolution that would bypass Israel and recognize Hamas. Even a Fox News reporter was duped when she responded, “I’m glad to hear that.” What she failed to grasp and report is that the entire Jewish community had been waiting anxiously, for more than a month, for the announcement he made that day. The audience’s wild applause in response to his revelation was as though a weight had been lifted from their chests and they could now breathe freely. However, Obama omitted one simple fact – his usual modus operandi to throw his enemies off track. According to reports from Tunisia, in May, Palestinian President Mahmoud Abbas said during a visit in Tunisia that the Palestinian Authority is ready to establish a state. “We are counting on the words of US President Barack Obama, who said his vision is to see a Palestinian state this coming September according to a deadline set by the Quartet.” How unusual that Obama didn’t mention this meeting at the AIPAC conference. http://www.zimbio.com/Mahmoud+Abbas/articles/qvkkaEVCiiG/Palestinian+Leader+Abbas+Obama+Promised+State No wonder he left this out. Where was the main stream media? To our readers: were you aware of this? And if that stunt wasn’t sufficiently dishonest, he would give them the full primrose path treatment, promising them all they’d wanted to hear, to undermine Netanyahu, who had just stood up to Obama on the previous day, at the White House, in response to the proposed 1967 suicidal border swap. At that point the entire AIPAC audience should have stood up and walked right out of that conference! This was a death sentence – yet, mesmerized, they stayed. Now Obama knew he had them in his pocket. There is not one fascist-terrorist organization in the history of the world that ever stopped fighting upon request (e.g., when Roosevelt asked Hitler to honor Poland’s borders). The President was saving his best for last. Obama continued, “And we once again call on Hamas to release Gilad Shalit, who has been kept from his family for five long years.” (Applause, standing ovation) Obama had covered all the bases, and the cheering audience luxuriated in Obama’s favor. He had positioned himself to appear as though he had Israel’s back - No Hamas. No UN resolution. The trap was set, and AIPAC was effectively disarmed. In no time, the guillotine blade dropped. Obama began laying the groundwork for the grand deception that would allow him to renege on all the promises he’d made to them only moments before, through his smoke and mirror tactics. He began by claiming he needed the Jewish people’s support so he could nullify the UN movement before it gained a foothold. The support he needed from AIPAC, he would contend, was their backing of his plan to start immediate negotiations in order to protect Israel from a world-supported United Nations mandate that would recognize a Palestinian state in September! What is the difference between the Palestinian push to acquire their own state in September and Obama’s rush to implement it sooner with a G8 mandate? Absolutely nothing! Both are one and the same. Both can only lead to the eradication of the Jewish state. Isn’t this a type of mob extortion? Offering you a deal you can’t refuse? Protecting you from a criminal enterprise of which they are a part? And in the end, you lose your business, your freedom, and your life. Does Obama seriously want Israel to believe that now, unlike the past, Iran, Syria, and Hamas will fear his resolve because he is flaunting his new “I killed Osama Bin Laden” award? Whom will he send to defend the borders when Hamas declares they will no longer recognize Israel? The United Nations? As I contemplate the source of power that enables this President to continually deceive even the most “intelligent” Jews among us, keeping them off balance and distracted from grasping his real agenda, I find it increasingly unsettling. The extent of his prowess is witnessed by what he was about to say next as he continued to steer AIPAC off course. As he assumed a stern posture and his countenance changed as he gazed over the audience, he continued, “And yet, no matter how hard it may be to start meaningful negotiations under current circumstances, we must acknowledge that a failure to try is not an option. The status quo is unsustainable. And that is what I stated publicly on Thursday. He was about to attempt to frighten the Jewish people into submission, telling them that Israel would become increasingly defenseless against a world-supported UN mandate that expected a Palestinian state post haste. And these were the very words he used to back up that threat – each one worse than the last. Second, the President stated, "Technology will make it harder for Israel to defend itself in the absence of genuine peace." Third, he claimed, "A new generation of Arabs is reshaping the region. A just and lasting peace can no longer be forged with one or two Arab leaders. Going forward, millions of Arab citizens have to see that peace is possible for that peace to be sustained." Finally, and the most dangerous threat of all, "And just as the context has changed in the Middle East, so too has it been changing in the international community over the last several years. There's a reason why the Palestinians are pursuing their interests at the United Nations. They recognize that there is impatience with the peace process, or the absence of one, not just in the Arab World, but in Latin America, in Asia, and in Europe. And that impatience is growing, and it's already manifesting itself in capitals around the world." Remember these words: "Impatience is growing" in the international community in the absence of a peace process. What is the generic name of a peace process that claims the international community is losing patience with Israel, because for more than 40 years she will not sign agreements that would set up an Islamic terrorist state in Israel in the West Bank? It is HOLOCAUST. “Now that Egypt has declared her independence from a tyrant, and other nations in the Middle East are following suit (to be known later as the onset of the Arab Spring), Israel is facing an imminent threat – one no less dangerous than that posed by a nuclear armed Iran. It is not Egypt, Russia, China or the United Nations that creates this threat. It is not even the possibility that Egypt will no longer honor the peace treaty with Israel. It is Obama, and Obama only, who is the cause. What is coming next for Israel is frightening! If it is Obama’s position that the US and Islamic nations are seeking freedom, and this is their best and only chance to work together to achieve peaceful coexistence for the entire region, then, G-d forbid, Israel would succumb. The Arab Palestinian/Israeli conflict has no bearing on whether the Islamic world will be successful in its quest to secure their freedoms. If the Islamic world were truly serious in its desire to embrace democracy and freedom from tyrants and terrorists, they would stand with Israel against the Palestinians! Why is the onus on Israel to make peace with criminal entities that refuse to recognize and promise to destroy the Jewish State? Is it the assumption that sacrificing Israel would prevent a world war between America and the Islamic world? 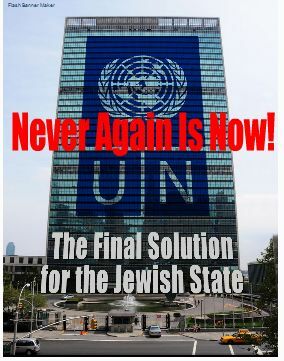 It is time to put to rest the insidious concept of blame propagated by Obama and Mahmoud Abbas, and embraced by the Islamic community, the UN, and the world at large. It is time to realize that the Israeli-Arab conflict is not the root cause of the tensions between the Islamic world and the United States, but the Islamic world’s addiction to the controlling, violent edicts of religious tyrannies. This misconception has spawned the idea that resolution of the conflict will bring reconciliation between our nations, resulting in a peaceful co-existence and economic security for America and her allies. Nothing could be further from the truth. The religious tyranny of Islam is the genuine threat to world security. Americans must stand together as one in order to consummate the holiest of endeavors – when America’s founding fathers crossed the bridge to freedom to launch in America what would become the final chapter in humanity’s quest to forever lock the door on any and all who would release tyranny’s deadly venom into the hearts of humankind. This is the point of reference America must use in order to expose to all free people those who have fabricated the lie that western imperialism is the cause of the Israeli-Palestinian-Arab conflict and the worldwide economic crisis – not the ill-conceived ideologies of our enemies that have divided us against ourselves at a time when we must unite to defeat the fatal enemy knocking on liberty’s front door. It is the spread of religious tyranny, the black plague of the 21st century, that must be eradicated by the armies of the righteous or this plague of death and repression will consume us all. It is this understanding that must take center stage in our war against terrorism, if we are to lift the cloud of confusion that now prevents the Free World from recognizing that the Arab-Israeli dispute represents much more than a regional conflict. In fact, it is part and parcel of a much greater battle in which not only Israel’s survival lays in the balance, but which also places democracy’s endurance on the line. I asked, “What would happen to the people of the free world if America faltered in her obligation to take action against those who have declared war on any of her allies, especially, Israel, her most ardent supporter?” The result would be the worst of all possible scenarios. America would forfeit her identity as the advocate for the advancement of freedom in this world, thus inheriting all the evil we fought against since the birth of our nation. The time has come for demands. Put down your pens and let your voice become your sword. In 2007, when President Bush and Senators McCain (R) and Kennedy (D) were eager to pass the "Comprehensive Immigration Reform Act of 2007," Americans, both left and right, hated the bill. So they "melted the phone lines" until Washington, Congress and the White house got the message and the bill was not passed. The American people let their will be known, and our President had to listen. Now it’s our turn to redirect Obama’s foreign policy to restore our nation’s honor. ALL THAT IT TAKES IS ONE PHONE CALL PER DAY, EVERY DAY, TO ACHIEVE WHAT THEY DID IN 2007. One of the better shots we have at getting the Joshua Call on a major cable outlet is Greg Gutfeld’s “Redeye” (212-462-5050) on Fox Channel. Although it is on in the middle of the night, it has a good following with many media guests, such as Ann Coulter. If Greg adopts the Joshua Campaign, it will spread like wildfire. Please make this call and follow it up every day with an e-mail copy of your demand until our goal is met .Please add this to your e-mail at the end of the message “Go to www.neveragainisnow.com/pro and click on Operation Joshua so you can fully understand our Operation Joshua action.